A student opera combining Purcell music and Shakespeare isn’t perhaps a standard night out. That is, to put it simply, because it is an outstanding night out. The meld of so many mediums makes on occasion for an overwhelming mix, with the audience never sure whether to next expect a monologue or an operatic duet. Nonetheless, there’s something incredibly charming about the plethora of talents and amusements a show such as this one offers up. A word of warning though; Shakespeare purists may find the Fairy Queen a slightly out of body experience, the words and turns of phrase entirely familiar yet spun in an alien setting. The oddness of the language fits quite neatly with the subject matter of the play, with Titania and Oberon’s fairies running amok amidst an enchanted wood, tormenting and tantalising the humans that stray across their path. Both Titania and Oberon were decidedly regal and yet foreign, their lavish and hedonistic costumes only adding to the real feeling that this production was transporting you to an entirely different land. Puck, played with almost manic glee by Georgie Murphy too was superb. Due regard should also be given to the actors in the ‘meta-play’ of Pyramus and Thisbe; who were all side-splittingly funny. The lovers too were played with a kind of comic petulance by Tobias Sims (Demetrius), Joe Stephenson (Lysander), Anushka Chakravarti (Hermia) and Hannah Marsters (Helena), and were clearly very well-rehearsed, their scenes filled with the kind of fast paced interaction that can only come through copious work in the run up to the production. The ensemble of the piece were slick and polished, big cast stage moments executed with vivacity and the sort of playful agility you’d expect of a band of fae. The staging itself was fairly stark in many ways, but given the colourfulness of the action going on in front of this carefully bare set it was not a surprising stylistic decision. And what breadth! Acrobats and singers, dancers and actors, comedians and tragedians; absolutely breath taking. Particularly impressive, and deserving of a special mention, was the singer who stepped in for Timothy Coleman’s role as Apollo at incredibly short notice. However, aside from this exceptional case, the singing overall was good, delivered with genuine feeling and the right mixture of stage presence and technical efficacy. There were occasions upon which one felt the size of the theatre at the Playhouse was slightly beyond the reach of some of the lungs of the singers, undoubtedly a daunting task. However, this was certainly not the case for all the singers, with the particularly raw and affecting lament of Indyana Schneider nearly reducing many to tears. Regardless of any flaws the production might have had, I think you’d be hard-pressed to find a member of the audience that genuinely didn’t enjoy the evening of full entertainment. This reviewer certainly left the Oxford Playhouse with the impression that this was not your average production, and not your average cast. On Thursday night, while the majority of my friends were fixed firmly in the very real world of essays, exams, and Netflix, I was sitting in the Playhouse, waiting to be transported far away to Fairyland by the cast of the Fairy Queen, a ‘semi-opera’ of the 17th century that interweaves Shakespeare’s text of A Midsummer Night’s Dream with a beautiful accompanying musical score by Purcell. The journey began with a Shakespearean-style prologue, delivered meticulously as the lights began to dim and the introductory music faded away, and entertainingly twisted to its modern day audience – we were invited to be part of a story ‘better than any on Snapchat’ – and was a much more engaging way of chastising mobile phone use than the usual stern reminders we get in the theatre nowadays. With the scene now set and the real world left switched off in our bags, we were transported to the opening scenes of A Midsummer Night’s Dream: the court scene itself can feel like a slow introduction to the play, necessary for establishing the situation as we are thrust in medias res into the tangled relationships between Hermia, Lysander, Helena and Demetrius, but the acting was superb from the start, not only from the main four characters (as mentioned above), but also from the well-defined characters of the Duke (Beth Evans) and Egeus (Ivo Gruev), establishing an entertaining relationship that was continued to great effect in their re-appearance towards the end of the play. Of course, the main focus of the play and the ‘masques’ – musical interludes interspersed throughout the drama – was on the events in the forest. With dramatic lighting, deliberately darkened beyond what is usual on-stage, we were constantly aware of the unfamiliar environment that is so important to the unravelling of the plot, which was effective as a counter-balance for the otherwise minimal staging and props – presumably because the size of the cast demanded the full command of the stage for large swathes of time. The costuming, too, was brought into focus so that our attention was constantly drawn to the people on stage, and not the stage setting itself: the opulent and other-worldly dress of the Fairy Queen (Rebecca Bowen) and Oberon (Laurence Belcher) was transposed alongside the comically over-the-top Jacobean dress of the four main mortal characters to stand out against the otherwise bare backdrop. The acting itself was of an incredibly high standard throughout, and carried the performance through to the end so that any potential for the play to feel broken up or bitty because of the extended musical interludes was eliminated. The outstanding highlight for me was the performance of Gregory Coates, who played Nick Bottom: without the right casting, Bottom’s scenes in the play can feel a little awkward, and I have seen past productions where what is often regarded as the comic high-point of the play has fallen rather flat. Coates, however, was fantastic throughout; wonderfully over-acting his part but also managing to strike the right balance between playing directly to the audience in his improvised farce and skilfully balancing his actions and reactions against those around him. In terms of the musical side of the performance, here too we were kept very well entertained: the drama was clearly played to its full comic potential, so the music provided a varied respite from the acting, even though I was sometimes a little bemused as to exactly how the interludes fitted with the part of the drama they followed, which, although charming, was also a little confusing. 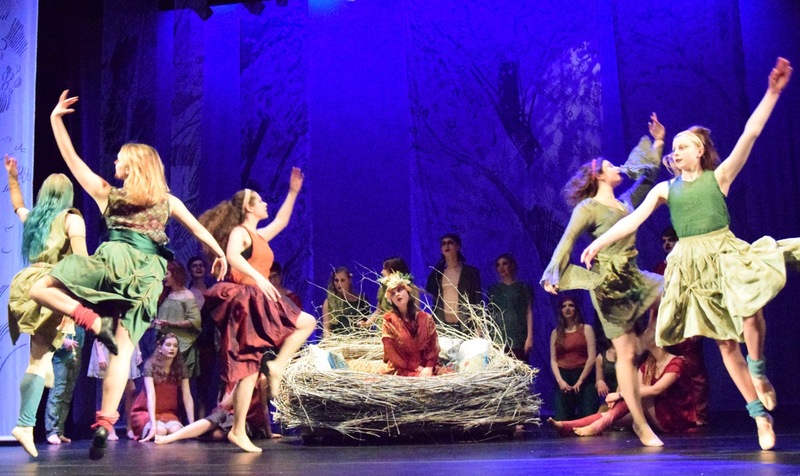 The chorus deserves a special mention, managing to effect complex movements around the stage whilst singing in beautiful harmony and complementing the highly talented individual acts of singing, dancing and acrobatics. If I were to criticize any part of this production, it would be the balance of sound between the soloists and the orchestra accompanying them: whilst the chorus was able to make their sound rise above the sound level of the music, the power of sound produced by soloists had a tendency to be swamped by the size of the auditorium and the size and volume of the orchestra, despite all aspects of the music being played to a very high standard. Overall, this was a very impressive production, especially considering the size and scale of the endeavour, and bodes well for the resurgence in Oxford student opera and semi-opera in the future.